Tim’s pineapple patch. Lettuce and cabbage planting area is in the background, now overgrown with weeds. Tim Rowan is a hard working farmer. In the winter he grows certified organic lettuces and cabbages. And in the summer, when it’s so hot that some farmers take a break, Tim is still growing things. His latest hobby, as he calls it, is raising pineapples. He has a test patch with over 70 pineapple plants in various stages of maturity. (Most started from tops salvaged from his kitchen where he is a chef at Deering Bay Yacht and County Club. He also grew several pineapples at his vegetable garden there.) Some plants on his farm are already bearing fruit. I asked Tim to save me a pineapple, and recently he let me know mine was ready, come and get it. Tim Rowan photographs the pineapple before it gets picked. And there it was, in all its glory — a very large pineapple perched on a short stalk sprouting from the center of of a spray of long, narrow, sharp toothed leaves. (If you’ve never seen a pineapple plant, it looks like a bromeliad.) The fruit was fully mature and golden yellow in color. It had a distinctive top — not one leafy crown, but at least six or eight all in a row. It looked like the pineapple was sporting a mohawk. Both Tim and I took pictures from various angles while it was still on the plant. If a pineapple could have charisma, this one did. 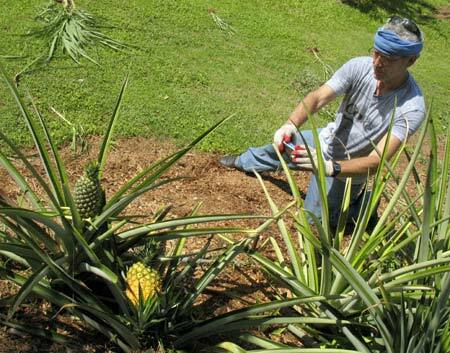 Check out Tim’s blog post about his adventures growing pineapples. Pineapple sporting a mohawk top. Tim had left the fruit growing on the plant so I could pick it myself. “Hold it with both hands, give it a little twist and snap it off,” he said. I did, and it came off easily in my hands. I was impressed by how heavy and substantial it was. Turns out it weighed five pounds. Several large suckers or shoots were growing from the base of the plant. They looked like overgrown pineapple tops. Tim broke one off carefully, and at its base were strands of white roots, ready to plant. This sucker would grow into a new plant which would bear fruit in one year. Tim removed other suckers and planted them too. “From one plant you can get as many as eight new plants,” he said as he set them into the ground. 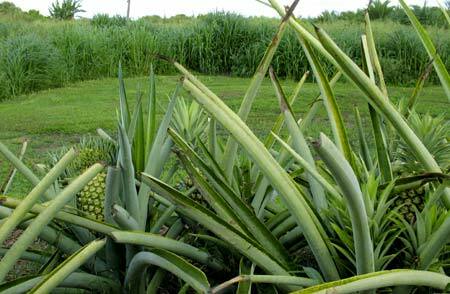 You can also plant pineapple tops, but it takes two years to flower and another six months for the fruit to mature. Picking pineapples, location not specified. Florida Photographic Collection. Pineapples are not unusual for South Florida. Settlers started growing pines, as they were called, in 1860 at Plantation Key. 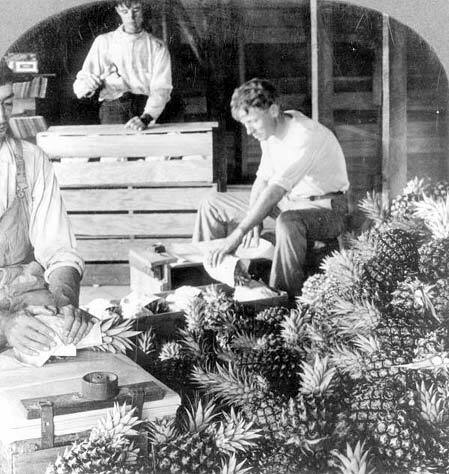 From the late 1880s to the early 1900s, pineapple was a popular crop, and almost everybody had a patch. 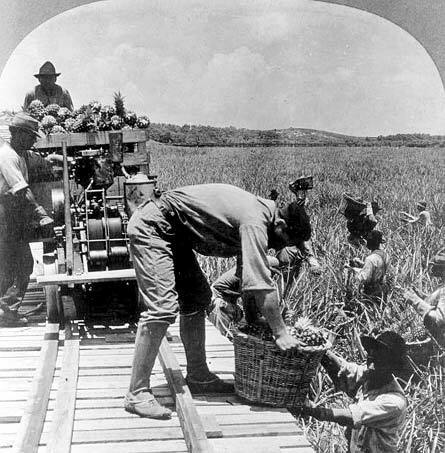 Plantations stretched from Plantation Key to the south, to Elliott’s Key (as it was spelled then), north to Lemon City settlement, up the coast to Yamato (west of Boca Raton) which was farmed by Japanese, and as far north as Indian River. The fruit was shipped by schooner and then rail to northern cities. Competition from Cuba and Hawaii, diseases, bugs, and freezes eventually wiped out the industry by the time of WWI. Boxing pineapples for shipping. Florida Photographic Collection. In more recent times, “A guy tried producing specialty pineapple in the mid-late 1990’s on the S.W. corner of Naranja Road and Quail Roost,” county agriculture manager Charles LaPradd told me in an email. “They were the small super sweet golden ones that sell for a fairly high price, so he thought he could compete against the imported ones. He couldn’t and went out of business.” These days, almost all the pineapple in stores is grown offshore. 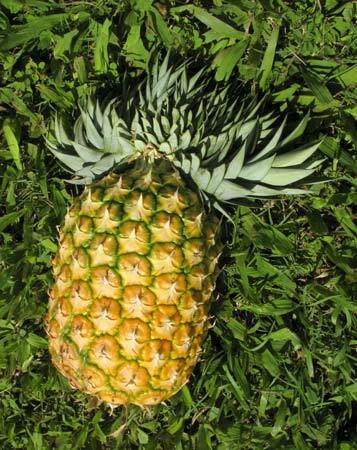 Costa Rica is the top supplier for pineapples for the United States. 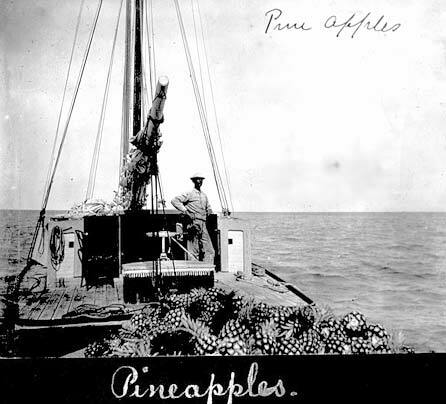 Shipping pineapples by boat. Florida Photographic Collection. Pineapple may not be grown on a large scale in Redland anymore, but many people grow a few plants in their own gardens. They are easy to grow, like full sun, and because the plant has a shallow root system, doesn’t mind growing in a container. Besides planting the top, save the peel of a homegrown or organic pineapple and use it to make a pineapple flavored vinegar. Here’s the recipe from Wild Fermentation by Sandor Ellix Katz. Use it to make salad dressing, put it on avocado, stir into salsa, or wherever you need a sweet-sour tang. 1. In a jar or bowl, dissolve the sugar in 1 quart of water. Coarsely chop and add the pineapple peel. Cover with cheesecloth (or coffee filter) to keep flies out, and leave to ferment at room temperature. 2. When you notice the liquid darkening, after about 1 week, strain out the pineapple peels and discard. 3. Ferment the liquid 2 to 3 weeks more, stirring or agitating periodically, and your pineapple vinegar is ready. Keep in refrigerator. Would love to know his secret for such BIG pineapples! Mine are very sweet and tasty but quite small by comparison. I started with tops I got from Robert (Is Here) quite a while ago, but haven’t fussed with them much (they are a unlovably prickly bunch). Can I guess that he waters during the dry season, and maybe adds lots of compost or other enrichment? Also – I notice he has them spaced closely together… does that make a difference for the size of the fruit? Excellent and informative. It does take patience for pineapples! Holy moly, 8 and 9 pounds?? That’s amazing! Thanks for sharing your soil recipe. Thanks, Tim!!! Well that’s interesting because I thought pineapples were basically bromeliads with a fruiting flower. So, I thought of them as air plants, not root based at all. I have deep soil, I just have never done anything except stick the crown off a pineapple into the ground, slush some mulch around it, and ignore it. Thanks for this info – I will do better by them in future. Hopefully they will feel the love. Pineapple wine? Wow! Must taste good! Hi, I just started growing pineapples in Florida, the Redlands … I’m not a farmer I have over 250 pineapple plants. Any other tips of growing them would love them thanks . Ohhhh almost forgot how do u make the wine?